MS854114E#01 Toilet Finish: Cotton, Trip Lever: Left-Hand Features: -Sleek, high profile one piece design. -Certified by the EPA’s WaterSense program, this advanced flushing system saves 20% more water than 1.6 GPF toilets. -Large water surface. -E-Max technology. -Wide, computer designed trapway. -Low consumption (1.28Gpf/4.8Lpf). Product Type: -One-Piece toilets. Material: -Ceramic. Dimensions: -Minimum supply line required for the toilet seat: 5″. Overall Height – Top to Bottom: -27.125″. Overall Width – Side to Side: -16.5″. Overall Depth – Front to Back: -28″. Overall Product Weight: -16.5 lbs. 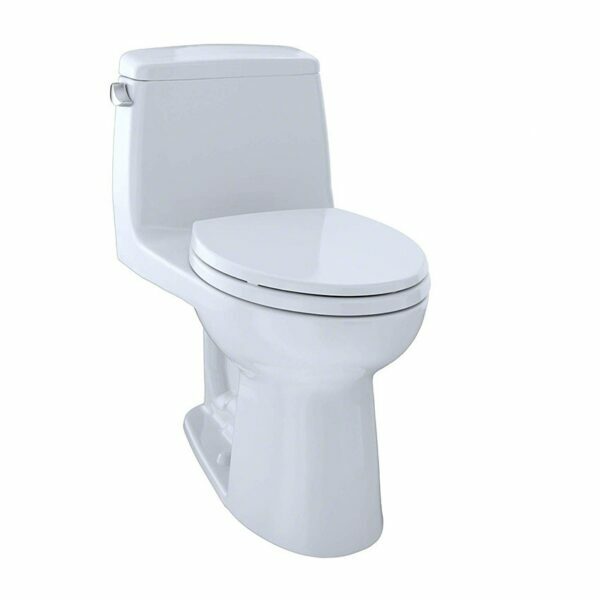 ADA Height, sleek high profile elongated one piece toilet with 12-Inch rough-in. E-Max Low consumption (4.8 Lpf/1.28 Gpf) siphon jet flushing action. Tank cover, fittings, chrome plated trip lever and SoftClose seat included. Unlike pressure assist toilets, which can be noisy and are made with more complicated moving parts, E-Max is a simple and quiet solution for effectively flushing 1.28 gallons. Utilizing the same proven engineering as the legendary 1.6 GPF G-Max flushing system, the 1.28 GPF E-Max reinforces Toto’s performance reputation while offering an additional water savings of 20 percent. E-Max features: Wide 3-Inch flush valve provides a quick, consistent and powerful flush. Large 2-1/8-Inch trapway is glazed to optimize waste passage. Pilot-operated fill valve ensures quiet operation and a clean shutoff at any water pressure. Extra-large siphon jet works in conjunction with the large glazed trapway; the siphon jet pulls away waste with incredible force. Toto’s SoftClose seat is the latest in innovative smart seat technology with Comfortable Ergonomic Design, Molded Bumpers, and High Gloss Polypropylene. (Resistant to Chemicals and Cleaning Agents.) Constructed of solid, high-impact plastic, this unique seat is specifically designed to reduce injury and to eliminate annoying “Toilet Seat Slam”. The seat and lid utilize a built-in SoftClose hinge system, which lowers the seat down to the bowl gently and quietly. The engineering of SoftClose incorporates Toto’s high standard of quality and consumer ease. Top tightening mounting bolts ensure easy installation. And of course, all seats are precision designed to fit regular or elongated bowls.